Please feel free to send me comments, to ask about any of the paintings or about commissions, or to be added to my email list. Cormorants on Pillar Rock, Cape Breton. While the subject matter of each piece is different, all the paintings and sculpture share a vibrant and hopeful outlook. This uplifting show features artists: Paulette Melanson, Dorothea LeBlanc, Lynn Johnson, Carol Morrison, Nancy Roberts, and Judy Arsenault. Now that the snow banks have finally gone, owner Jane asked me to keep the paintings in her gallery a bit longer, so they are still on view. 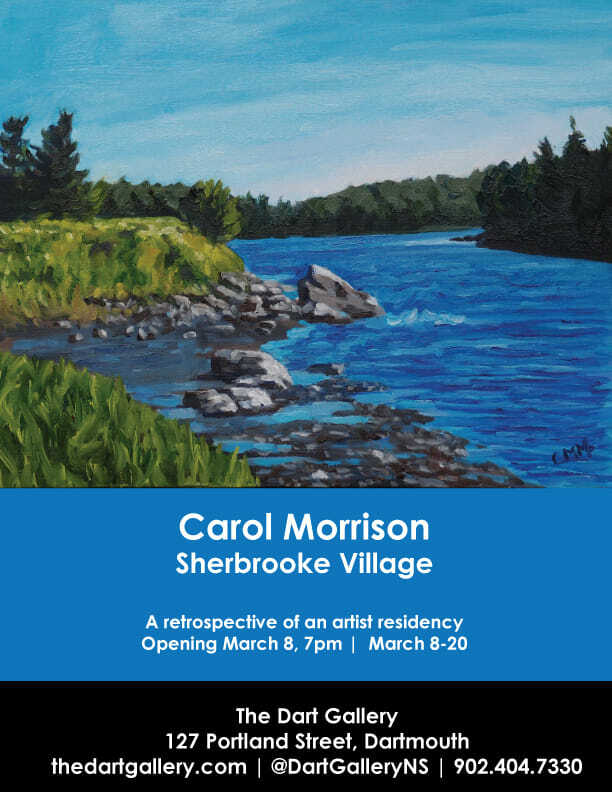 Last year I spent nearly three weeks as the artist in residence in Sherbrooke Village. It was an amazing experience, living back in the 1860s! When the gates closed during the day, no cars were allowed in the village, and the interpreters wore period costume. The great summer weather last year meant lots of opportunities to paint outdoors. I took part in both the "Paint Peggy's Cove" and "Paint the Town" in Annapolis Royal, and here are some of my paintings. I was delighted to find a wonderful home for my painting "Silver Dart", which was painted for a Visual Arts N.S. group show called "Flight", commemorating the first powered flight in Canada. It is now in the Silver Dart boardroom at the Halifax International Airport. As a biologist and an artist, I feel that we are very much part of nature, and I am very aware of the wonder of the world around us. I find that nature is always unexpected, and I am fascinated by the constantly changing appearance of lakes, woods, brooks and fields. When I first came to Canada, I was stunned by the magnificent blaze of red maples, yellow aspens and golden tamaracks in the fall and the interlacing shadows on sparkling snow in winter. These contrast with the piercingly blue sky of sunny fall and winter days, which I rarely saw in England. The relatively short but sunny summer means that there is a colourful parade of flowers to paint in my garden. My main inspiration in portraying nature has been Tom Thomson, especially his plein air studies. 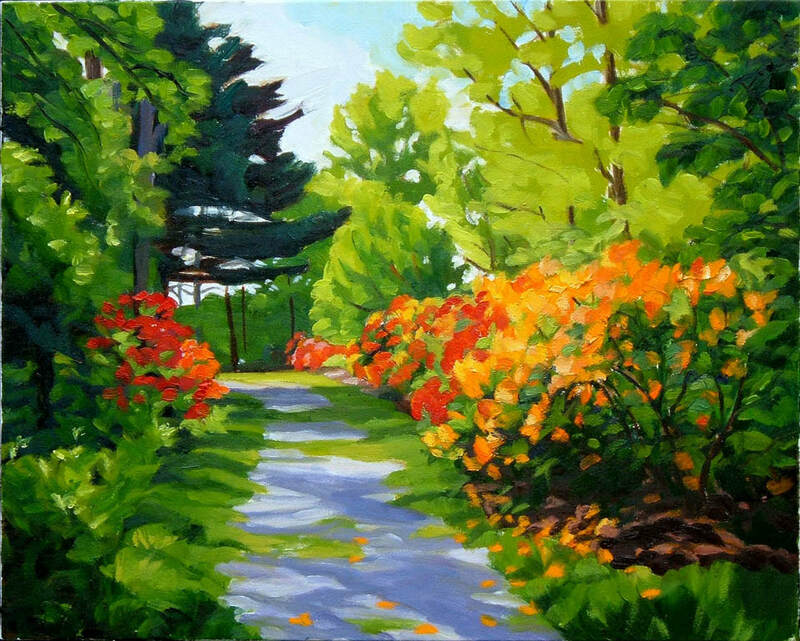 I also enjoy painting in the open air, surrounded by nature, and I try to show the vitality of what I experience by using expressive brushwork and vibrant colours. My interest in living things extends to portraying some of the wonderful people I have met, painting either from life or from photographs, so that I can show them in relaxed poses in their own surroundings. Recently I painted portraits of victims of human rights abuse, and "Portraits of Injustice" was shown in the Harbourside Gallery of the Immigration Museum in Halifax. This project, which has since been shown in Antigonish, Port Hawkesbury and the St John Arts Centre, was awarded a NS creation grant. 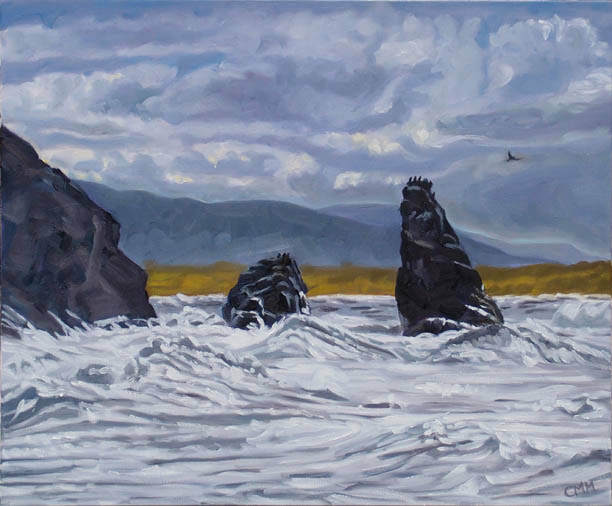 After a fulfilling career as a research scientist, closure of my DFO laboratory in 1997 led me to pursue my lifetime love of painting, and I graduated from NSCAD in 2005 with a major in Fine Art. I received the Elizabeth Greenshield's Award for an emerging artist in 2005, and the NS Art Bank bought my work in 2005, 2006, 2009 and 2010. My paintings are featured in Landscape Painters of Nova Scotia (Nimbus Press), edited by Dee Appleby. Link to review by Elissa Barnard. I welcome commissions, including portraits. My prices vary from $600 for a small portrait to $2,400 for a full-length 72X36" portrait. I usually work at close to life size, so my smallest portraits are around 20X16". I can paint from life, but have usually worked from photographs because it is difficult to arrange sitting times. I like to take the photographs myself if possible, since I find it important to meet the subject.